Sorry, no big fancy multipart essays this time I'm afraid. (at least I don't think I will be doing anything like that thus far). Basically I wanted to share some pictures I took over the past couple weekends visiting with the Beijing Wushu Team while they're here in the US hosted by the National Wushu Training Center in Huntington Beach, California. Wait, where's the wushu? - Before you ask, let me tell you. You won't find much in the way of photos of wushu here because NWTC had a no photography policy at their performance, and I am respecting that. Hopefully pictures of wushu superstars not doing wushu is almost as good. Brandon, Mark, Matt and I pose for a picture with some of the guys on the Team. 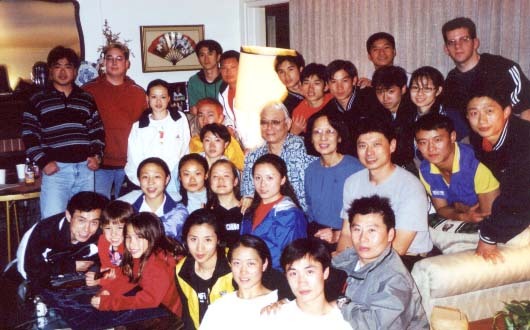 Brandon's Parents invited the Beijing Team over for dinner! Would you be willing to feed 20 ravenous wushu superstars? Lucky for us, Dr. and Mrs. Sugiyama were. Here Brandon joins Shao Changjun, Li Qiang, Hei Zhihong and Liu Yang at the dinning room table. A couple others are in the kitchen going back for seconds. The Beijing Team (and us hangers-on) join The Sugiyamas for a final photo. Me and my dear, dear friend, many time Women's All-Around Champion of China, Liu Qinghua, before the Beijing Team's open seminars at NWTC. Liu Qinghua ran the changquan workout, which gave about 20 lucky Americans the honor of working their asses off Beijing style. 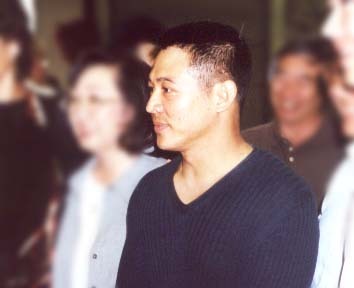 OK, here we go, Jet Li in person. 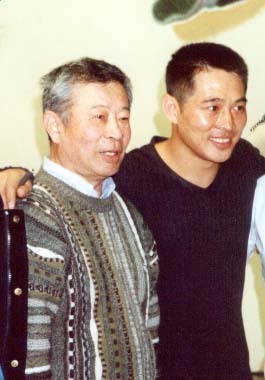 Jet along with his former coach, Wu Bin. here to read an article about Wu Bin, supposedly written by Jet himself. 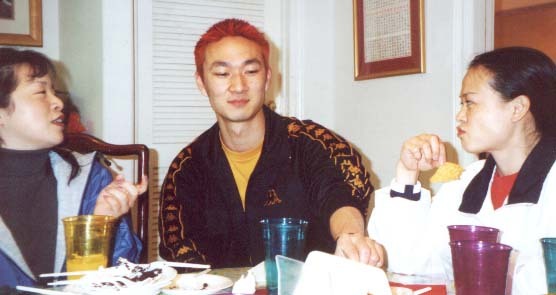 After the performance, our pal Phillip Chen invited us to join the team at a dinner hosted by his father. 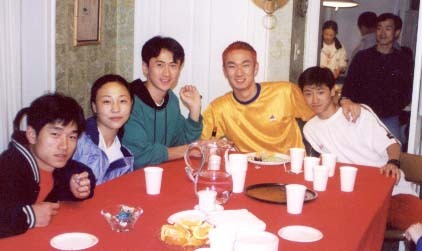 Afterwards the team went over to his house to enjoy some dessert. 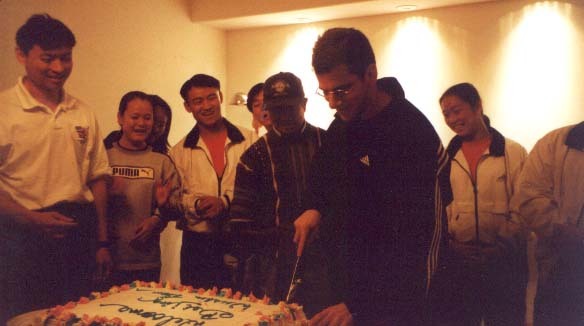 I was reluctantly enlisted by Wu Bin to represent the Berkeley crew visiting in the cutting of the "Welcome Beijing Team" cake. Flora, Brandon and Liu Qinghua chit-chat and enjoy nachos. This and the next photo were taken by my pal Hansie. This is right at the end of the Beijing Team's performance. Jet came up and posed with the team. Also from Hansie (who unfortunately got slightly cutoff there on the left), this is the "Wushu People from Berkeley" picture with Jet. Representing the Pacific Wushu Academy coached by Phillip Wong and Zhang Hong Mei, The UC Berkeley Wushu Club coached by Li Jing and Wushu West coached by Hao Zhihua (immediately to the right of Jet). At least Jet's actually looking at the right camera for this one, even if the rest of us aren't. Alice came prepared for an assault on Jet. She asked him to sign her poster. Jet went the extra mile and even got on his hands and knees to satisfy a fan. OK, I went back the weekend before they left, I got a ton more pics, hopefully I'll get a chance to scan them in soon.